The CCSC Rifle range offers covered shooting positions with bench rest. There are fixed position and movable target stand bases to 100 yards. Target frames are located in the shed. Bring your own paper targets. There are gongs at 230 yards. When you are done shooting, put your target frame back in the shed and police your brass. If you do not want your brass, place it in the 5 gallon brass bucket located under the shelter. One of the goals of CCSC is to educate youth in the safe use of firearms. 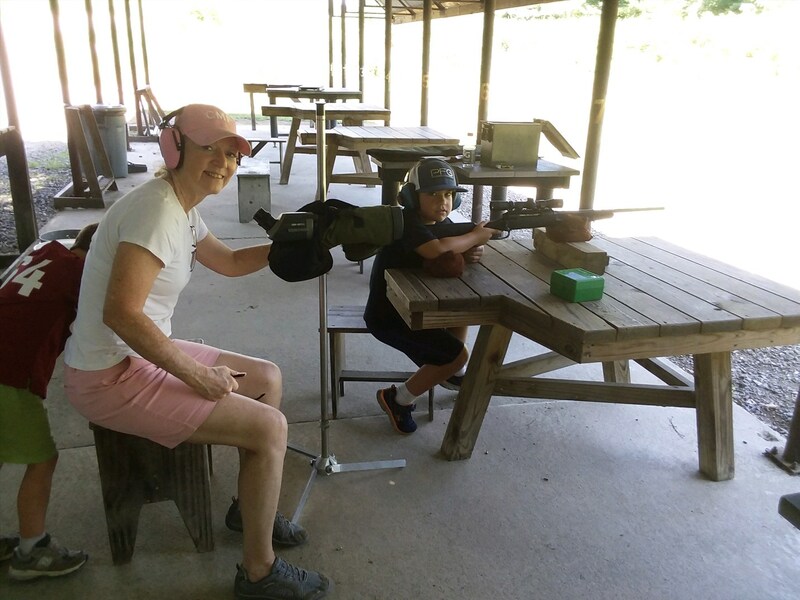 Here, 8 year old William Irby sucessfully "rings the gong" at 230 yards, William's Grandmother Julie, an experienced competition shooter, spots for him. Please read and understand the CCSC Rifle Range rules before using the Rifle Range. Click on the "RULES" tab and scroll down to "Rifle Range Rules". REMINDER: Shotguns are NOT allowed on the rifle range unless you are shooting slugs. Shot destroys our target frames and backers. For shot, use the patterning board behind the metal storage shed, or check with the Shotgun Director for other options. Check the rules for shot size and minimum distance before using the patterning board. Using shot on the rifle range is grounds for suspension AND further action by the Board.